Part One is a list of the records created and used by the Aborigines Protection Board - renamed the Aborigines Welfare Board in 1940 - which was established in 1883 and held its final meeting in 1969. This was the main New South Wales State Government agency which implemented and administered the legislation and policy having an impact on Aboriginal people throughout New South Wales. 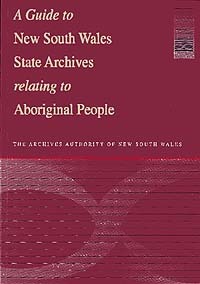 Part Two is a list of material created by other New South Wales Government agencies which contains significant mention of Aboriginal people. The records relating to Aboriginal people, like all the other records held by State Records, are working documents created and used by a large number of public servants in the course of their official duties over a long period of time. In simple terms, the records are a result of Government activity at various times. It is important to remember that at the time of their creation, they were not intended to be used for the purposes for which they are today, that is for research.